I don’t know if you can see it – but – on the second one, the grooms fingers are actually digging into the ground. He is SO opposed to going the direction his bride is dragging him. To me, they aren’t funny at all. These depictions make me so sad. This was me – for 14+ years in our marriage. This was what I was trying to do emotionally and spiritually to my husband. It did NOT work! These little figures accurately depict some destructive dynamics at work in many marriages in our culture today. This is NOT a picture of the one Spirit relationship between Christ and His church. 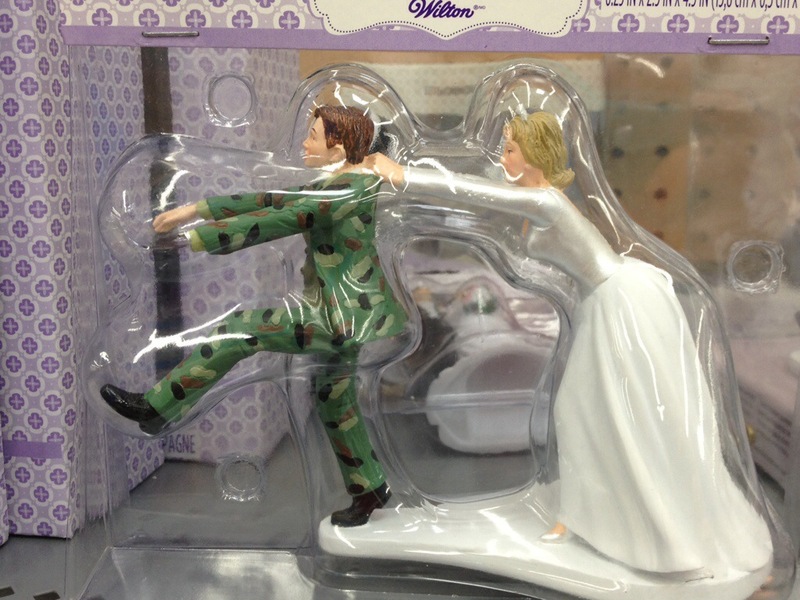 I think these cake toppers are a great visual for us as wives to remember. When we try to control our husbands, this is how they feel. It’s not a very romantic picture, is it? If you were in this guy’s shoes – what would you want to do? It is IMPOSSIBLE for anything romantic to happen when a wife has her hands emotionally around her husband’s throat. Romance only happens when a man is free to give of himself as he sees fit. As women, we must decide between trying to control our husbands and having intimacy (Laura Doyle “The Surrendered Wife”). They are exclusive opposites. If we have one, we can’t have the other. Each spouse has to be a willing participant – and not feel forced or coerced – if there is to be real intimacy. We as wives ALL deeply long to be loved, romanced, cherished, adored, honored, appreciated, protected and well-cared for by our husbands. 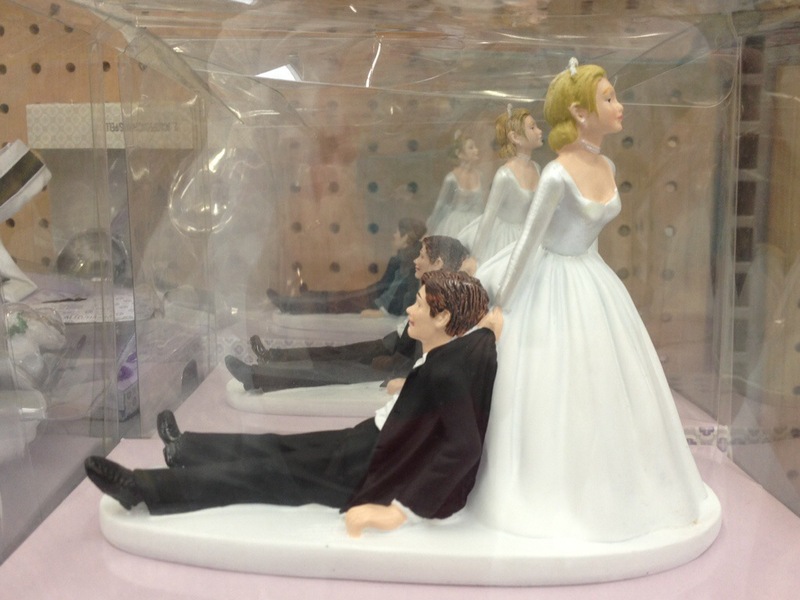 Let’s imagine that one of these little wedding cake toppers is me and my husband. I am trying to force Greg to do what I want, to submit to my will, to do things MY way. I think that I am so right and my way is the only way that is acceptable. This is me verbally trying to drag my husband to be the man I think he should be. This is me trying to change my husband. A controlling woman repels her man. With her own hands, attitudes and words, she destroys the relationship (whether she knows it or not). She demands everything and her husband reluctantly gives her as little of himself as possible, sealing his heart shut tight so that she cannot have it. A woman who allows her man to lead and who honors and respects him will draw him to herself very subtly. She inspires him to desire her. She demands nothing – and yet he willingly gives her everything, including his whole heart. No one in the world – humanly speaking – has as much influence and power to bless or destroy a man as his wife has. Many women have no idea where their power is or how to harness it for good. Some of us try to change our husbands by verbal force. I did that for over 14 years. But the truth is – we can’t change them. That’s actually a good thing. When someone tries to change a healthy man – he will resist. A man who is wiling to be controlled by his wife is not emotionally/spiritually healthy. God did not give us power to change our men. He gave us something INFINITELY BETTER. He gave us the power to inspire our men to want to be all that God designed them to be. We don’t do that by demanding, criticizing, humiliating, complaining, nagging, preaching, ridiculing, ordering or coercing our men by verbal attacks and insults. These things destroy and crush our men’s souls. Men are very sensitive to our disrespect. Even just a look of contempt or disdain or a hateful tone of voice can crush our husbands’ spirits. Many women think that if we respect our husbands and honor their leadership that we lose our voice and power as women. But that is not how God’s design works at all! The only power we lose is the power of our sinful nature to destroy. When we are living in total submission to Christ and full of His Spirit, we have the power and riches of heaven blasting through our souls and pouring through us to bless our husbands and children. There is no greater power in the universe than the omnipotent, sovereign, mighty power of God! A minister at my church who is teaching a class on spiritual authority says that Satan’s definition of “freedom” is the ability to do whatever we want. He says that God’s definition of “freedom” is having the power to do what God desires us to do. God gives us the freedom, desire and power to inspire our husbands to become the heroes God designed them to be as we become more and more the wives and women God designed us to be.